This blog entry will extract and comment on the more useful material from Mr Smith’s description of his masturbation history, habits, and methods. Commentary on the second page of descriptive data provided by Mr Smith. (1)- left eye useless and orientation of the head changed but not as much change in the facial features as you would expect from the severe changes to my body. My left ear is less developed and lower than my right ear. By less developed I mean that the cartalige is much thicker and has more ridges and shape in my right ear. For privacy Mr Smith chose not to provide head and face pictures. For that reason no commentary can be offered on the above statements by Mr Smith. (2) – My right shoulder appears to be higher than my left shoulder but it is mainly an illusion from the trapazoid muscle being way overdeveloped on my right side and virtually non existant on my left side. This picture emphasizes the very slight difference in height between Mr Smith’s right shoulder and his left shoulder. The uneven height of the shoulders gives both shoulders a slanting look from high on Mr Smith’s right to low on his left. The trapezius muscle that Mr Smith is referring to is a muscle that connects either side of the neck and the back. The next picture is an artist’s drawing of the trapezius muscles with arrows highlighting them. 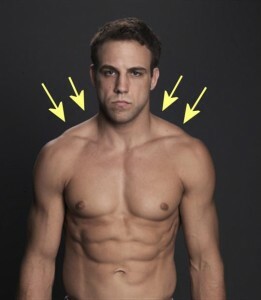 This picture shows a fighter with strongly developed trapezius muscles. 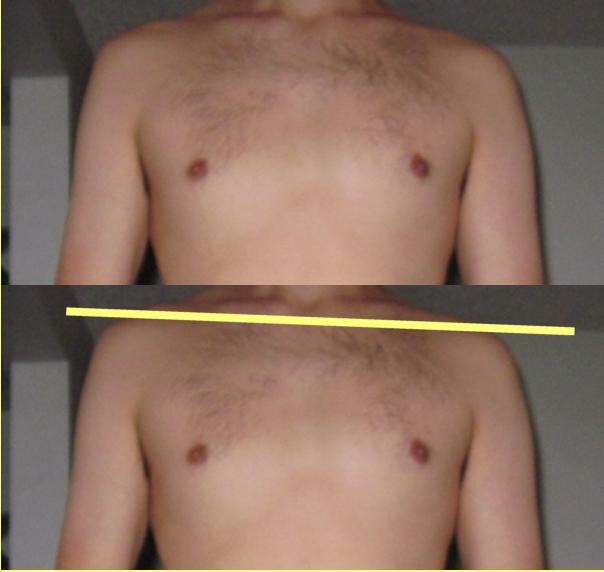 Mr Smith stated that he thought the difference in height between his right and left shoulder “is mainly an illusion from the trapazoid muscle being way overdeveloped on my right side and virtually non existant on my left side”. 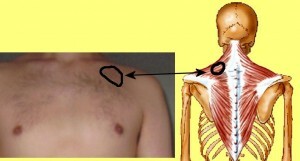 Because of the angle of the picture only a small part of Mr Smith’s trapezius muscles can be seen. 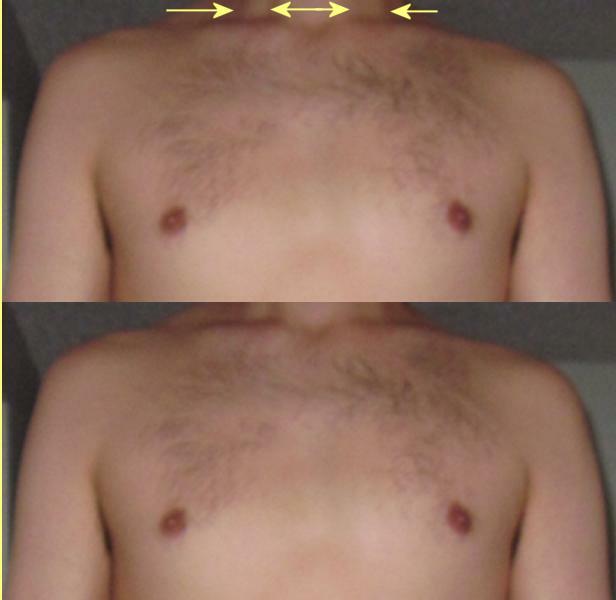 What can be seen of his trapezius mucles does seem to confirm his statement that his right trapezius muscle is larger than his left trapezius muscle. 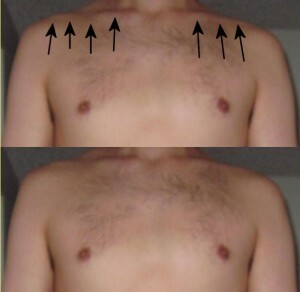 While it is true that the difference is the size of his trapezius muscles does visually contribute to the perceived difference in shoulder height, it is not correct to say that the shrinkage of the part of the trapezius muscle above the shoulder is the main cause of the difference in shoulder height. 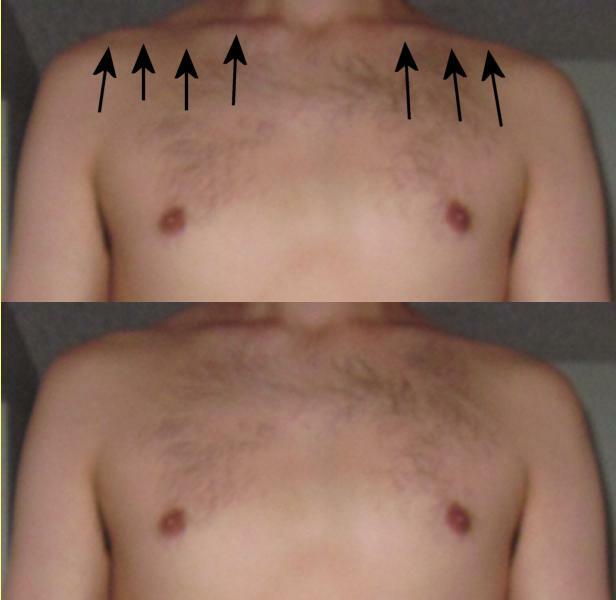 The main cause of the difference in the height of Mr Smith’s shoulders is the atrophy of the area beneath the left shoulder. There is a large wide area underneath Mr Smith’s left shoulder that shows signs of shrinkage. The circles in the next picture approximately enclose the same area under both shoulders for comparison. The shrinkage of the area under the left shoulder has revealed a long straight line that is not present in the same location under the normally sized right shoulder. There is a bruised area under the left shoulder that is outlined in this picture. The next picture outlines a smaller part of the bruised area under the left shoulder. The area outlined in the picture above can be thought of as the center of the bruised area. 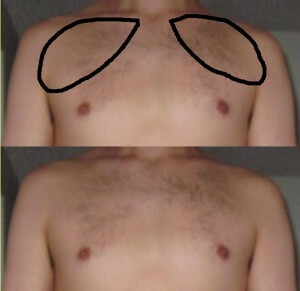 The shrinkage of this area under the shoulder is actually the main factor causing the vertical shrinkage in height of the left shoulder, and not the visible shrinkage of the trapezius muscle above the shoulder as Mr Smith thinks. 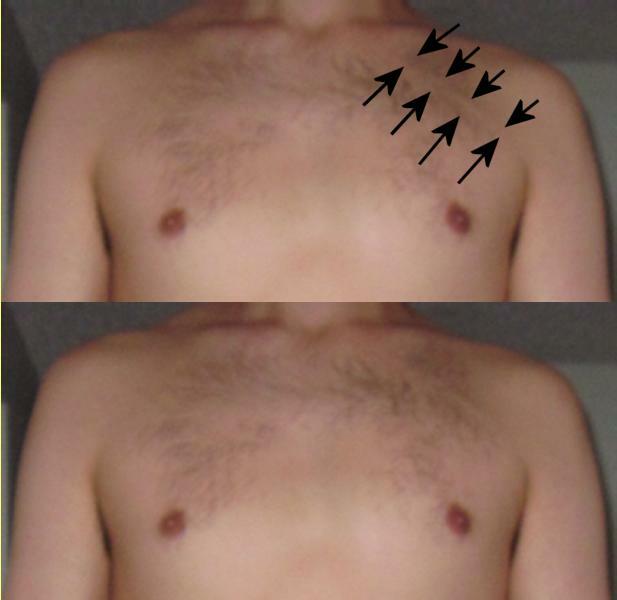 The area where the dark bruise is located on the front of the body corresponds to a section of the trapezius muscle on the back of the body. That correspondence implies that Mr Smith’s entire trapezius muscle has shrunken, and not just the part that is visible above the shoulder. The shrinkage under the shoulder in the area of the dark bruise has tightened the skin in that area so much that there is a long ridge of the clavicle bone showing by the left shoulder that does not look the same as the muscle and skin covered clavicle bone under the right shoulder. The inward side of the clavicle bone on the right side is thicker looking, indicating more skin and muscle covers it than the same area on the left side clavicle bone. 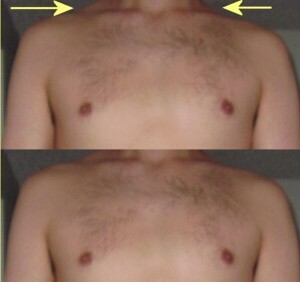 that is more shrunken than the same area on the left side of the neck. (3) – My girlfriend noticed that I talk out of the right side of my face more so I guess that could be considered cigar mouth. No pictures of Mr Smith’s mouth are available to comment on. While there is no picture of Mr Smith’s forehead to comment on, an explanation of what Mr Smith is referring to can be provided. According to Happeh Theory, masturbation can change a human being to look and act like a demon. That statement requires a short explanation. According to Happeh Theory, every creation ever produced by human beings is based on the human body in some way. According to Happeh Theory, the creatures called “Demons” that are supposed to be mythological and imaginary, are really human beings whose physical body, personality, and mentality have changed in a particular way. 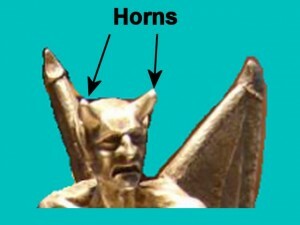 The next picture shows a statue of a demon with horns sticking out of his forehead. The man in the next picture has a large bump on his forehead. 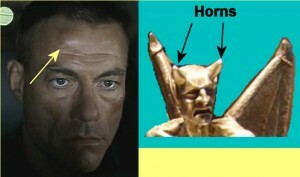 The bump on the man’s forehead is in a similar location to the horn on the demon statue’s head. Disregarding the actual cause of the bump on the man’s forehead, the picture was presented to demonstrate a real human being with a bump on their forehead, in the same location as the horns on a demon are supposed to be. Further discussion of this subject will end here so as not to get sidetracked from the analysis of Mr Smith’s verbal description of the masturbation caused changes to his body. The still curious reader is encouraged to view the Happeh Theory videos on this subject. (5) – My right foot is a half size smaller than my left foot and they become the same size as I stretch my right snake. No pictures of Mr Smith’s feet are available to comment on. 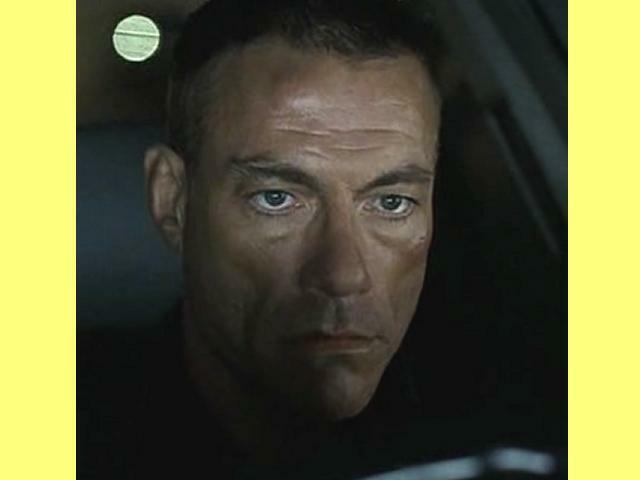 Mr Smith’s reference to “stretch my right snake” is a reference to one of the theoretical models of the human body created for Happeh Theory. According to The Two Snakes View of the Human Body, the human body behaves as if it consists of two large snakes. The tail of one snake runs from the left foot up to the head while the tail of the other snake runs from the right foot up to the head. There are multiple versions of The Two Snakes View of the Human Body. The difference between each version is the path the body of each snake follows as it travels from the foot up to the head. One version depicts each snake as running straight up from it’s respective foot to the same side of the head as demonstrated in the next picture. Mr Smith’s statement “stretch my right snake”, is saying that as he stretches the right snake of The Two Snakes View of the Human Body, he notices that the length of his feet even out. (6} – I have pain and tighness in all my joints on the right and it really does feel exactly like you show with the shrinking snake on one side of my body. This statement supports the claims of Happeh Theory on how masturbation changes the human body. Mr Smith stated earlier that he masturbates with his non dominant or left hand. In the sentence above Mr Smith states that all of the joints on the right side of his body are tight. 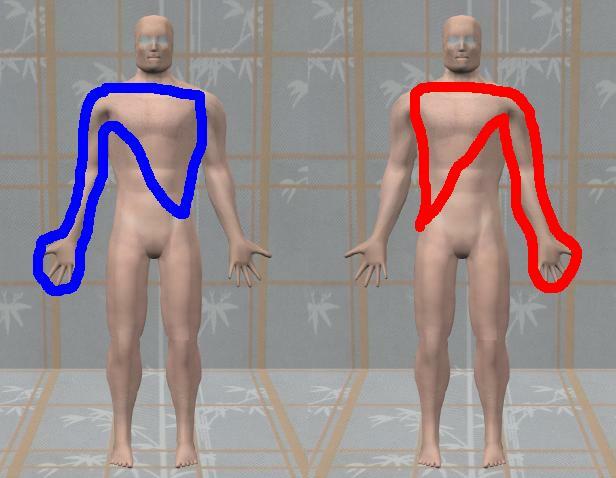 The preliminary conclusion from that data is that masturbation with the left hand will cause tightness of the joints on the right side of the body. That preliminary conclusion is supported by Happeh Theory. According to Happeh Theory, masturbation with one hand will change the opposite side of the body. Mr Smith also refers to the snake of The Two Snakes View of the Human Body theoretical model in this statement. A graphical depiction of what Mr Smith is saying cannot be provided because there are multiple versions of The Two Snakes View of the Human Body. It would be necessary to know which version Mr Smith was referring to before a graphical depiction of what he is saying could be provided. (7) -My fingers and toes are both way less flexible on the right side but the toes get better as I stretch the ligament behind my knee. According to Happeh Theory, masturbation will affect the entire body in some way. Many people have difficulty believing this claim. They do not understand how masturbation that takes place in the groin of the human body could affect any other area of the human body. This statement by Mr Smith that he has limited flexibility in his right fingers and toes, and his statements about his masturbation history, support the claim that masturbation does affect other areas of the human body. The connection between Mr Smith’s knee ligament and his toes is the Yin part of his body. Masturbation shrinks the Yin part of the body. The Yin part of the body passes through the back of the knee on it’s way to the foot. 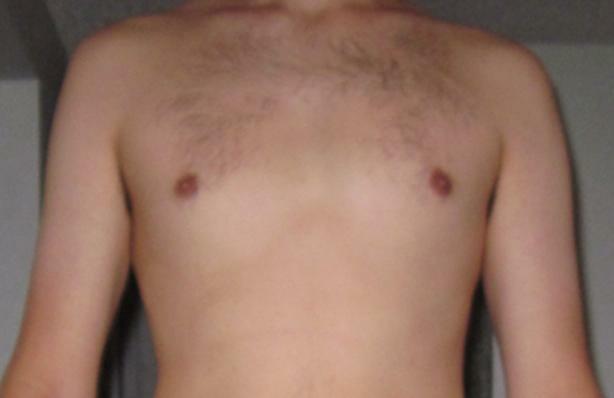 (8) – My ribs are actually dislocated because of the severe twisting of my torso due to masturbation but I am not sure how clearly it will show up in a picture. I am also not sure which side is out of place at this point but the left ribcage looks like it is laying on top of my right rib cage where they meet at the sternum. My right rib cage is angled away from my body like I was leaning to the right at all times as well as angled forward a bit. It is difficult to know exactly what Mr Smith means by “my ribs are dislocated” and “my left ribcage looks like it is laying on top of my right rib cage”. For that reason no comment will be made on those statements. The detailed information provided by Mr Smith about his ribs is that he believes his right rib cage is angled abnormally forward and to his right. 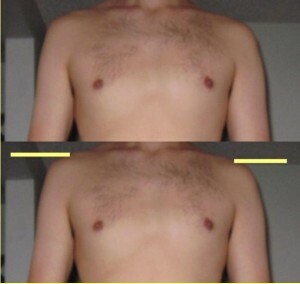 The next picture shows a closeup of Mr Smith’s rib cage area when he is standing in a normal standing posture. Examination of this picture does not make it any more clear what Mr Smith was referring to when he stated his “rib cage overlapped at the sternum” or that his rib cage was “dislocated”. 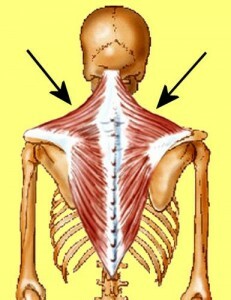 The next picture shows a closeup of Mr Smith’s rib cage while his arms are raised over his head. This picture is more revealing of what Mr Smith is getting at when he says his ribs are “dislocated”. Mr Smith’s ribcage angles from the the left at the top over to the right at the bottom. The slanting of the rib cage makes the bottom of the right side of the rib cage look higher than the bottom of the left side of the rib cage. There is a large bump on the left side of Mr Smith’s ribcage that is not matched by a similar bump on the right side of Mr Smith’s ribcage. Evidence of what Mr Smith means when he said “my right ribcage is angled forward a bit” can be found in the darker area under the bottom of the right rib cage. The size of the darker area indicates the bottom of the ribs are sticking relatively far out in front of the stomach. The changes noted in the right side of Mr Smith’s rib cage are the kinds of changes that can be caused by masturbation. 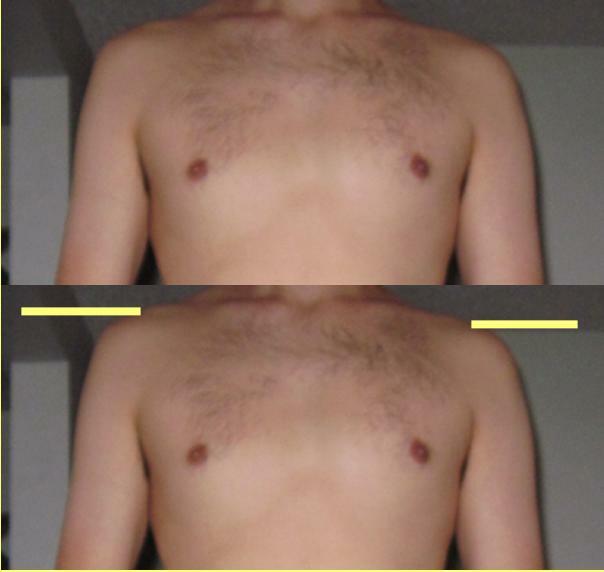 Masturbation has shrunken parts of the body around the ribcage itself, and the parts of the body that hold the ribcage in it’s proper alignment. The shrinkage of the area around the ribcage contributes to the different look between the two sides of the rib cage such as the bump on the left side of the rib cage and no bump on the right side of the rib cage. The shrinkage of the other areas of the body that hold the ribcage in it’s proper alignment are responsible for the rotation of the bottom of Mr Smith’s ribcage to his right. (9) – The worst pain that I ever feel from these conditions are right between my shoulderblade and my right spine always hurts. The spine at that area does not easily bend to my left. I have to make kind of jerky twisty movements while throwing my right shoulder up towards my ear. This is very painfully and slowly breaking down whatever fiberous tissue is preventing the mobility but it is seeming to get the job done. These statements are all descriptions of tightness of the body. Masturbation has tightened or frozen Mr Smith’s right shoulder so much that the tightness causes him constant pain. No pictures of Mr Smith’s back are available. Therefore no comments about the condition of his shoulderblades or the area between the shoulderblades and the spine can be made. (10) – The overall description of my body is that I feel incredibally tight everywhere on my right side and not at all on my left. My left side is as suple as a new born but at the same time nearly useless from lack of muscle. This statement is similar to the statement made earlier in comment #6. In comment #6 Mr Smith stated “the joints on the right side of my body are tight”. Here he says that the entire right side of his body is tight. The same comments made on statement #6 apply here. 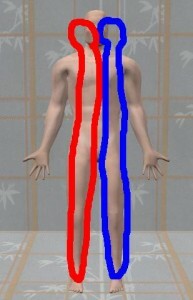 The condition of Mr Smith’s body supports the claim by Happeh Theory that masturbation with one hand will change the opposite side of the body. Specifically, the right hand is connected to the left side of the body, and the left hand is connected to the right side of the body. 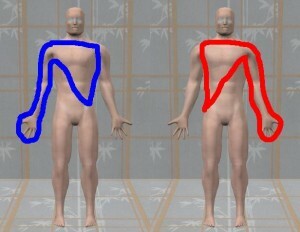 The next picture shows a simplistic view of how each hand is connected to the opposite side of the body. That is a simplistic picture only and does not accurately depict exactly how the hands are connected to the opposite side of the body.